Global2030 released the first comprehensive assessment of all time-bound targets of the United Nations' Millennium Development Goals. The report, which comes following the close of the MDG time frame, documents the achievements and the shortcomings of the targets. A key finding is that 8 of the 15 MDG targets reached between 80 and 320% of their goals, with most achieving about 150%. It also calculates the number of annual deaths prevented since the introduction of the targets to be between 6.85 million and 8.75 million. The child mortality target is found to be the biggest life saver. Furthermore, the pace of progress is shown to have increased in most indicators of the MDG targets. The report will be sent to heads of states, UN organizations and business companies. P.S. : A summary of the report was released at Deliver2030 , which is run by the Overseas Development Institute (ODI). ... more on "Achievements of the Time-Bound MDG Targets"
Global2030 offers internships or volunteering placements for refugees with a scientific background. See www.Global2030.net/refugees. Global2030 is the new name for the successor project of Global2015. The name change is related to the close of 2015 as the main target year of the UN Millennium Development Goals (MDGs) and the adoption of the UN 2030 Agenda for Sustainable Development. As Global2015 did, Global2030 monitors the most important global challenges including, among other topics, all MDGs and many SDGs (Sustainable Development Goals). The legal name of the registered association (Global2015 e.V.) will also be changed but we intend not to include a year number (in case new global challenges appear after 2030). Global2015 presented its evaluation of the SDG targets at the Institute for Futures Studies and Technology Assessment (IZT ). Using our data collection, a balanced assessment revealed the extent to which the goals are realistically achievable and those goals that will require extensive efforts from stakeholders. The presentation addressed shortcomings of the SDGs where tangible targets were missing and important issues were absent. However, the overall assessment revealed the strengths of the SDG targets and potential to achieve positive results by 2030. In line with a series of our latest publications, Global2015 submitted a fact sheet on current trends to the UN negotiations on the post-2015 development agenda. The fact sheet provides trend diagrams on MDG target topics as well as new and emerging challenges. The fact sheet identifies progress, setbacks and new topics for the SDG targets. It utilizes annual trend data series from the 2015 Global Burden of Disease study and includes a comparison with the most recent WHO and UNAIDS trend data. Two further fact sheets of our series have been submitted by Global2015 to the UN negotiations on the post-2015 development agenda. The first fact sheet contributes to the tweaking of the post-2015 targets. It focusses on 8 SDG targets and provides proposals for changes as small as possible to make these targets more clearly quantifiable, to specify x-values in the draft or to preserve the intended aspiration. Our work is evidence-based and all recommendations are fully in line with the proposed post-2015 development agenda. The second fact sheet proposes indicators for 17 selected SDG targets based on publicly available data. It was also submitted to the UN Statistical Commission (UNSC ) (see stakeholder feedback ). The second fact sheet of our series was submitted by Global2015 to the UN negotiations on the post-2015 development agenda. The fact sheet focusses on target 3.3 on infectious diseases, which was proposed by the UN Open Working Group on Sustainable Development Goals (OWG). The fact sheet can contribute to the technical proofing of the SDG targets. The evidence-based recommendations are fully in line with the proposed post-2015 development agenda and do not refer to any controversial topics or risk unravelling the package of the SDGs. The fact sheet provides a comparison of the contagious diseases with the highest numbers of deaths. For selected diseases – each on individual pages –, it presents the latest trend data and a data-derived recommendation of an ambitious but achievable target level for 2030. The first fact sheet of an upcoming series was submitted by Global2015 to the UN negotiations on the post-2015 development agenda. The fact sheet focusses on target 8.8 on safe and secure working environments, which was proposed by the UN Open Working Group on Sustainable Development Goals (OWG). The fact sheet provides a comparison with other major global topics in terms of relative importance. Furthermore, it presents latest trend data and a data-derived recommendation of an ambitious but achievable target level for 2030. The fact sheet is based on the latest available data, in particular from the ILO, the Global Burden of Disease (GBD) study 2015 and the WHO Global Health Estimates 2014. Further fact sheets are being prepared, and you can register for receiving them at our fact sheets page. Global2015 submitted a new proposal for the UN negotiations on Sustainable Development Goals (SDGs). 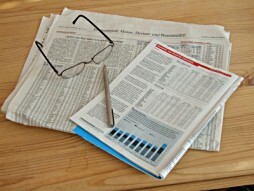 It addresses several open issues of the ongoing negotiations. The proposal provides an assessment of trend changes achieved by the Millennium Development Goals (MDGs) and derives from that an average level of aspiration for the SDGs. Furthermore, it suggests an approach to define global targets that accommodates the consideration of national trends and country conditions. Additionally, the proposal identifies major topics for the post-2015 agenda, based on the latest data on mortality and economic losses. This includes the update of the Global Burden of Disease study from December 2014 and January 2015. Finally, the proposal suggests framing or clustering the 17 SDGs into a small number of summary objectives, in order to facilitate effective communication. Global2015 submitted "Data-based Recommendations on Targets Proposed" to the UN Open Working Group on Sustainable Development Goals (OWG) . The OWG has developed targets which continue on from the Millennium Development Goals (MDGs), which have an end date of 2015. The Sustainable Development Goals (SDGs) are intended to cover the time frame up to 2030 and will be agreed upon by the UN General Assembly. 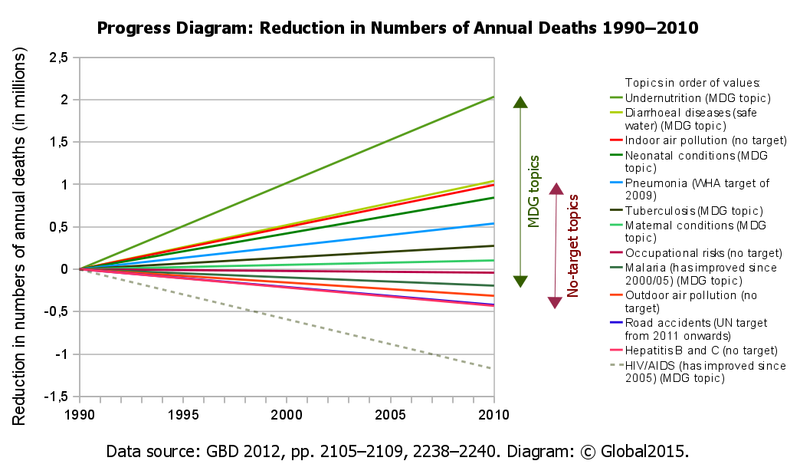 The data and diagrams in our paper show both progress and setbacks among major global challenges, including MDG topics, between 1990 and 2010. Currently most major global challenges, though not all, are covered by time-bound and quantifiable targets proposed by the UN OWG. In particular, our paper provides data and suggestions on seven post-2015 targets proposed by the OWG, with regard to epidemics, air pollution and occupational safety etc. The paper is a pre-release excerpt of an upcoming update of our previous publication "Assessing Priorities for Rio+20" (see below). It utilizes data from many trustworthy sources such as the latest version of the Global Burden of Disease study and the WHO Global Health Estimates of June 2014. P.S. : The final UN OWG outcome document includes now: "by 2030 … combat hepatitis, water-borne diseases, and other communicable diseases". A further post-2015 target has now been made time-bound: "by 2030 ensure universal access to sexual and reproductive health care services, including for family planning, information and education". These changes are concurrent with recommendations made by Global2015. A proposal was written by Global2015 for the preparation of "Rio+20", the United Nations Conference on Sustainable Development, which will take place in June 2012. The objective of Rio+20 is to secure renewed political commitment for sustainable development, assess the progress to date, and address new and emerging challenges. The Global2015 proposal focuses on providing neutral information on major global challenges. This includes prioritizing the most urgent challenges that the world faces today, and identifying which issues have made the most progress and which have been neglected. The data on global challenges has been updated and diagrams have been included to show the comparative relevancies of the major global challenges, the progress made on issues, and target accomplishments. The proposal has been sent to the heads of appropriate UN [United Nations] bodies along with other international organizations involved in the preparation of Rio+20. Global2015 has created a report on "HIV/AIDS in the Context of Other Global Challenges". The purpose of the report is to assist decision-makers in assessing priorities for appropriate action, taking into consideration global challenges interlinking with HIV/AIDS. Heads of government, ambassadors to the UN [United Nations], and the heads of related UN bodies were provided with the report, in regard to the High-Level Meeting on AIDS of the UN General Assembly (8-10 June 2011). The presidents of Switzerland and the USA (United States of America), governments from countries such as Australia, Brazil and the UK (United Kingdom of Great Britain and Northern Ireland), as well as the EU (European Union) Commission and the WHO (World Health Organization), responded with their appreciation of the objective and comprehensive nature of the analysis. The report is complemented by a summary of the outcome of the UN meeting. This publication is the first of a Special Global Challenges Report series; the next will be on climate change, for the occasion of the UNFCCC (United Nations Framework Convention on Climate Change) conference in December 2011. Global2015 was invited to present its Global Challenges Survey at the annual meeting of the Safe Injection Global Network (SIGN), which is hosted by the World Health Organization (WHO). 135 registered participants from 28 countries attended the conference, which lasted from the 9th to the 11th of November, 2010 in Dubai, the United Arab Emirates. Feedback on this first international presentation of the Global Challenges Survey was very positive, and several participants agreed to give expert reviews of the draft survey. New estimates of the global burden of disease due to unsafe injections were also presented at the conference. With these estimates a trend in the safety of injections globally is visible for the first time − an improving one. These estimates will be taken into account in the next update of the Global2015 draft survey. A Special Edition of the Global Challenges Survey was created for the United Nations Summit on the Millennium Development Goals (High-Level Plenary Meeting of the UN General Assembly, 20-22 September 2010). 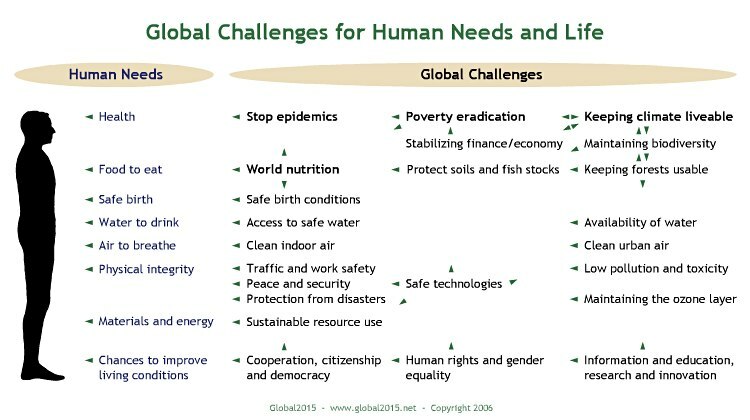 The updated survey by Global2015 covers most of the Millennium targets as well as other important global challenges. Global2015 has provided the survey to world leaders and UN representatives, and will continue to monitor the most urgent global challenges to encourage further action. Global2015 is proud to announce the first public draft of its overview on global challenges of the 21st century. 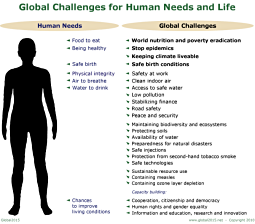 It summarizes the most urgent issues for human life and needs. Information is drawn from reports of scientific institutes, UN (United Nations) organizations, national departments, and others. Analysis shows the progress already achieved in some of the areas.